As the host of a large or even small event the one thing on your mind is ensuring that your guests have an enjoyable time. Having prepare, cook, serve meal, or clean up after your guests meal just adds to the chaos, creating stress for the host. By hiring a catering company to cater your next event in Michigan, you will be able to enjoy the party right alongside your guests. There are many perks that come along with hiring a catering company that many hosts are unaware of! From the time you hire a catering company in Michigan, their job begins. A menu needs to be determined with the host to ensure that meal selections are suitable for guests. Most catering companies will also offer an alternative food choice for children as well. Once the meal menu is determined your catering company may prepare the food prior to the event or may even cook the meal on-site. This will vary depending on the company that you choose. 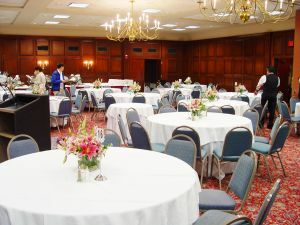 Based on the time you have set for dinner service, your meal will be laid out in a buffet style or served for your guests to enjoy.Throughout service, your catering company will ensure that your guests are taken care of throughout their meal, replenish condiments, and clear tables of empty plates or glasses. Cleanup will be the responsibility of your catering company. To ensure that you enjoy your upcoming event, be sure to add hiring a professional catering company to your checklist. Marquis Food Service will assist you every step up the way ensuring that you can focus on entertaining your guests. Contact us today to hire a professional catering company in Michigan.